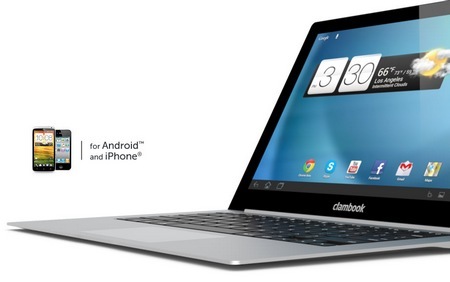 ClamCase introduces its ClamBook, a ultra slim Macbook Ait-style companion for iPhone and Android smartphone. With a sleek aluminum design, the ClamBook is designed to bring your smartphone a big screen, full-sized keyboard and a multitouch trackpad. This is not the first time to see this kind of notebook-style smartphone dock. There were Palm’s Falio and Motorola’s Lapdock, but both of them are intended for their own devices. ClamCase’s clambook, instead, works with iPhone and Android smartphones. It has a 16:9 widescreen display and features 3D Cinema Sound sound enhancement. It uses MHL technology, meaning a single cable is needed for coecting your smartphone. Te ClamCase CalmBook leptop dock will be available in holiday season 2012.